Although, his cousin has seen one – a tear-drop-shaped UFO which flew slowly over her house at night. He said there was no noise until it hummed after stopping. Mr Downing even thinks that a UFO could have caused the “fire” that never consumed the burning bush in front of Moses? He said: “What is not amazing to me is not that we had a burning bush… we had a talking bush. He has also looked at the book of Exodus, including the cloud that moved with the Israelites. He said: “The cloud of fire moves… you know… it goes in front of them then it stops and moves some more. On the cover of the latest book – the original was published in 1968 – there is an image of Moses watching the Red Sea part with a shiny UFO above the waters. He is also convinced a UFO turned up during the 100th anniversary of the apparitions of the Virgin Mary in Fatima, Portugal, earlier this month. He said: ““The UFO got in the way of the sun, causing the earth to seem darker, and this would make the ball of light show up even more. “Church people have trouble with what I’m doing. People who’ve seen UFOs have no problem. “It represents an inversion of the old story of Galileo and the Catholic Church. 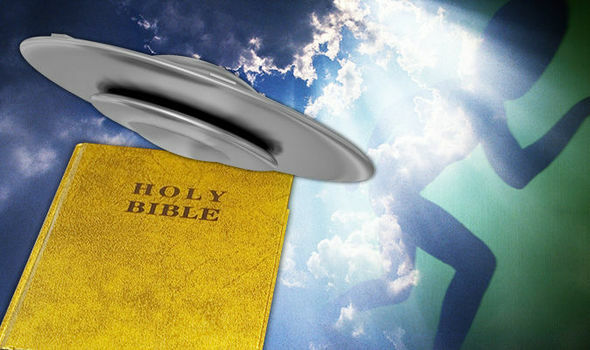 Mr Downing has many critics within Christianity, however, he is far from the first to push forward a theory about aliens visiting Earth for thousands of years. Many ufologists claim to have found pictures that resemble flying saucers in the air in religious works of art. And the Ancient Aliens theory claims advanced visitors from out of space came down thousands of years ago to help build monuments like the Pyramids of Giza.